The art of Melbourne artist Robert Rooney was born of a life in the suburbs and nurtured by many years’ working in bookshops. Rooney is both a passionate collector of everyday ephemera and reader of contemporary art books and journals. Somewhat obsessive by nature, he has gone through stages of meticulously researching the life and work of various artists and writers: in the mid 60s he was one of the most informed artists in Australia although ironically one of the least well travelled. Melbourne art in the 60s was still dominated by the cultural battle between expressive figurative painting and the more recent emergence of colour field painting.1 Influenced by the hard edge abstraction coming out of the United States, a new generation of artists exhibited in ‘The field’, the inaugural exhibition of the new National Gallery of Victoria building in 1968. Among them was Robert Rooney, who since 1967 had been painting a series of work which, although using the vocabulary of colour field painting, was in fact closer in intent to pop and conceptual art. ‘Canine capers III’ 1969 (AGNSW collection) uses a process that Rooney first developed in his ‘Slippery seal’ series of 1967. As both a celebration of the mundane and a means of eliminating the subjective decision making of the artist, Rooney devised a system of applying colour and shapes that rendered the actual painting of the work as mechanical as possible. Superficially appearing as abstract paintings, the works drew not only their titles but also their means of execution from the back of breakfast cereal packets. Rooney collected cereal boxes with cut-out toys printed on the back and used the cut-out shapes to create stencils for the repeated patterns on his paintings. The scalloped ‘windows’ laid over the top were derived from the border of a Christmas cake box and even the colours were chance selections from house paint colour charts. In the early 1970s Rooney gave up painting for 12 years and started to produce photographic works, thus extending the notion of mechanised production. Using a standard lens on a 35mm camera, he documented his suburban life through multiple commercially developed snapshots, each devised by a rigorous conceptual framework. 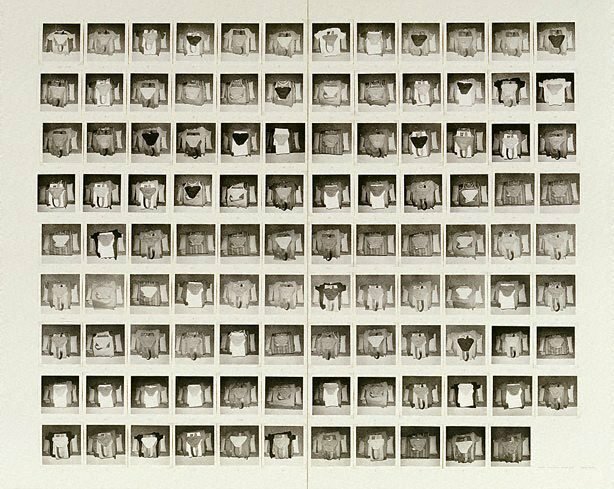 For ‘Garments 3 December 1972 – 19 March 1973’ Rooney neatly laid out and photographed the clothes he was going to wear each day for 107 days and displayed the resulting photographs in a grid. As in most of his photographic series, the grid is not quite complete suggesting the appearance of lines in a paragraph and inviting the viewer to scan the lines from top left to bottom right as if reading a text. Signed and dated l.r. mount, pencil "... 3 DEC 1972 - 19 MAR 1973 ROBERT ROONEY".